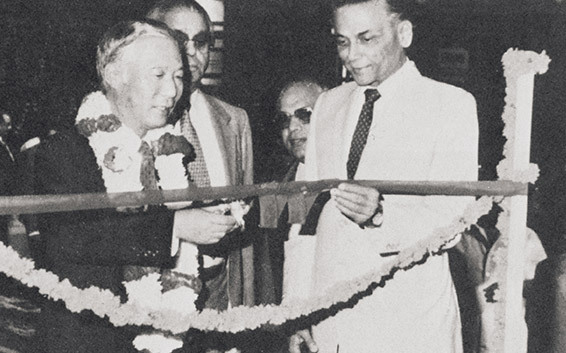 Yamaha's involvement in China began some time ago with the holding of the Guangzhou Yamaha Exhibition in December 1979. At the exhibition, Yamaha presented its products, conducted technology symposiums and safe driving classes, and broadly promoted its products, engineering capabilities, and corporate policies to the people of China. Exports of motorcycles began the next year in 1980 and in 1981, the company established the Yamaha Guangzhou Service Center in the city of Guangzhou, Guangzhou Province. China subsequently tightened import restrictions on durable goods, and exports of completed motorcycles to the country were no longer allowed. 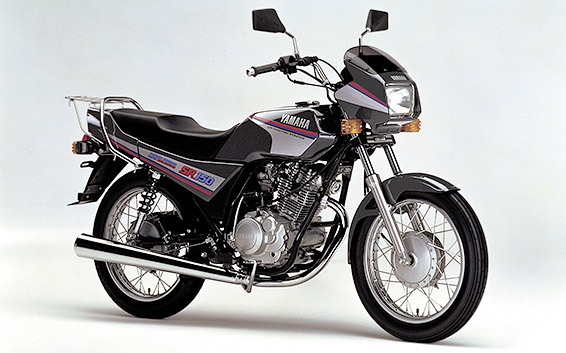 In response, Yamaha concluded a technical-assistance agreement for manufacturing the Yamaha Mate (CY80) with China North Industries' Jianshe Machine Tool Factory in 1983. Production of the CY80 began the following year in June. The motorcycle was launched under the joint brand Chongqing Yamaha and proved to be a popular model. Annual production subsequently rose to 400,000 units. 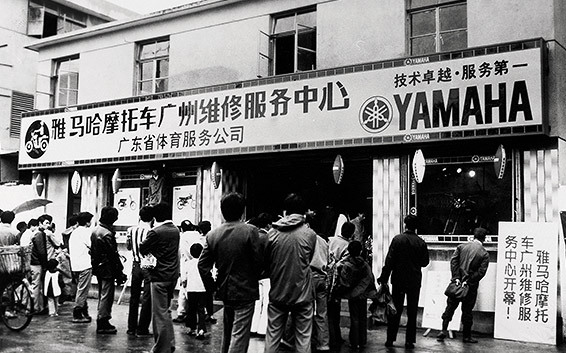 In 1985, Yamaha entered into a technical-assistance agreement with China National Aerotechnology Import & Export Beijing Corporation and began production in July of the same year. In 1992, it partnered with Jianshe Machine Tool Factory to establish a new joint venture, Chongqing Jianshe Yamaha Motor Co., Ltd. (CJYM), creating a production system capable of manufacturing 60,000 units of the 4-stroke SR150. 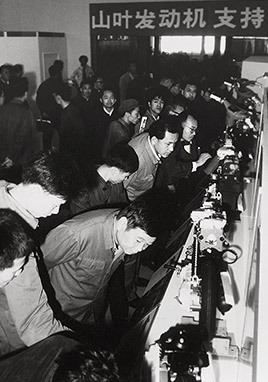 Thereafter, Yamaha established a succession of local affiliates in an effort to raise its local parts procurement ratio, establishing Sichuan Huachuan Yamaha Motor Parts Manufacturing Co., Ltd. (SHY) for electronic components in 1993, inking a joint venture contract with Chongqing Pingshan TK Carburetor Co., Ltd. (PTK) in 1994 for manufacturing carburetors, and establishing Zhuzhou Nanfang Yamaha Shock-Absorber Co., Ltd. (NYS) in 1995 for manufacturing suspension systems. Around the same time the company was establishing local affiliates in China, Yamaha concluded a technical-assistance agreement for manufacturing the RX100 with Escorts Limited, a major Indian manufacturer of tractors and construction machinery. In 1984, Yamaha built a factory in the Surajpur Industrial Park, which was developed by the Indian government, and produced the RX100, which went on to become India's best selling motorcycle. 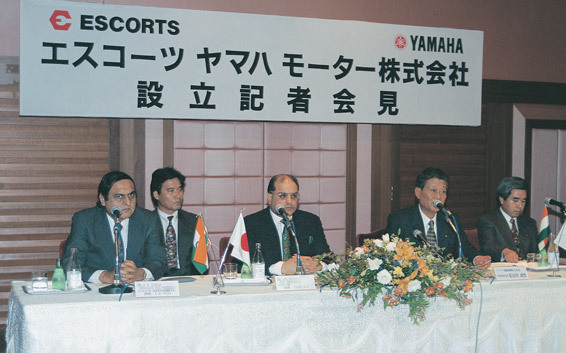 In 1996, the company established the joint venture Escorts Yamaha Motor Ltd. (EYML) and renamed it Yamaha Motor India Private Limited (YMI) in 2001 as it became a fully-owned subsidiary.